stop you in your tracks! Driving with a severely worn brake rotor like this is extremely dangerous! 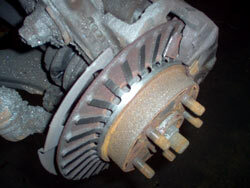 Regular brake inspections and maintenance will prevent problems like this.